The Rat Pack lives on forever! Enjoy a night of classics from a bygone era. Book online for Insider Pricing! 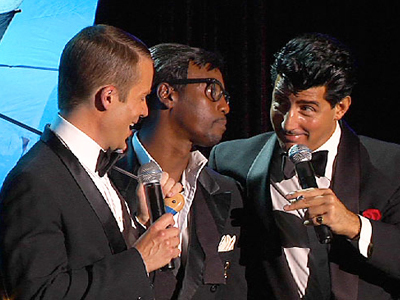 One of the best Rat Pack shows around is "The Rat Pack is Back" at Rio Crown Theater. Book online today to take advantage of $20 off tickets. Rates start at just $40 before taxes and fees. 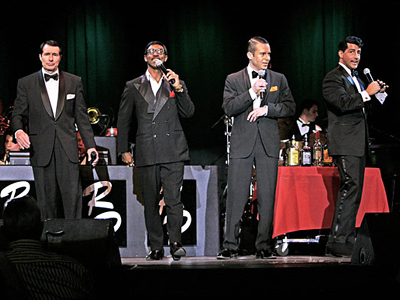 Revisit the bygone era of the Rat Pack at the Tuscany Suites and Casino with this amazing tribute with talented singers portraying Dean Martin, Frank Sinatra, Sammy Davis Jr, Joey Bishop and even Marilyn Monroe. A 12 piece orchestra keeps your toes tapping while watching the performance. 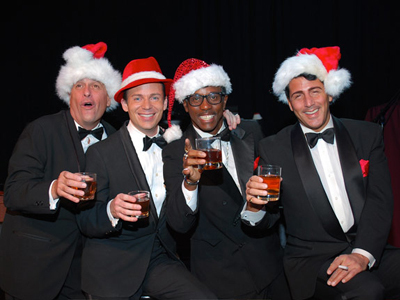 Before there was Elvis, there was the Rat Pack. Video clips of vintage Vegas play on big screens to the side of the stage and you will swear it really is the “Pack” on stage. Their cool demeanor, charisma and playful camaraderie are all reminiscent of the real entertainers. Dean takes center stage with a drink and cigarette in hand and belts out the old standards. Sammy Davis Jr. joins him for “That Old Black Magic” and the other performers casually interrupt each other for some good old-fashioned revelry. Marilyn Monroe joins the guys and croons “Happy Birthday” to some lucky audience member. You will have a good time watching these cool cats with their timeless musical stylings. A lot of singing from my favorite singers in the 1960′s. 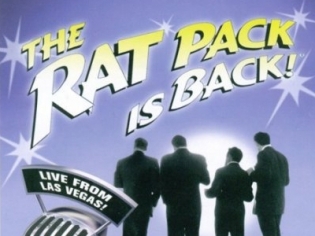 The Rat Pack is Back takes you back in time to when the stars of that century walked among us. It was enchanting to see all of the great ones filled with life once again, performing at their best! Wonderful show, Wonderful Performances All Around! We went to this show for a bachelorette party. Thought the bride was crazy for wanting to see it. We had so much fun at this show. The guys were great and the singing was wonderful. I will have to take my husband to this show in the future. 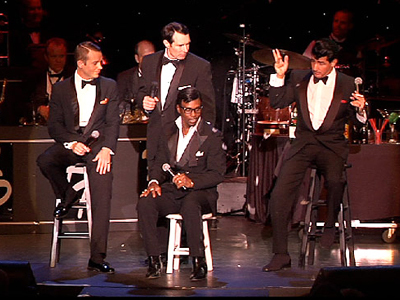 I grew up listening to The Rat Pack because my dad is a huge fan and oh my goodness these guys were fab! Dean was my favorite! Look, acted, and sounded like him! Really glad I decided to do this show! Vegas..... The Way It Should Be! Awesome Fun! Everyone Is Fab! Especially “Dino”! We see this show twice a year. And the Rio is a good venue. This takes me to the Vegas that was at least for a short time. Great cast. Good show. Frank and Sammy are fantastic and the music, oh the music. Wish the customer service was better but worth it. Remember tho that old Vegas worked on tips and your seats will be great. The show itself was great. The leads sounded just like the originals.. Frank and Sammy were identical. The show itself was great. The theater is old and worn down. The carpets were torn in certain places. The drinks were really expensive too.